Steve McEwen showcases Nike's skirting of official sponsorship status and takes in a sponsored exhibit. Steve McEwen is an experiential marketer who most recently worked as a communications manager with Initials Marketing in London. He has worked across events, promotional marketing and sponsorship activation in Canada with brands including Microsoft Xbox, Rogers Communications and Samsung Mobile. He is blogging for MiC throughout the London 2012 Summer Olympic Games. Nike has been making brand waves around town with its “Find your Greatness” campaign, which has cleverly flirted with the IOC and LOCOG sponsorship regulators both inside and outside of the UK. The campaign is focused on the regular folks around the world who are champion athletes in their own right: a careful manoeuvre seeing that Nike created the celebrity-athlete sponsorship craze many years ago! The campaign is led by traditional media, but there has also been some OOH around London – this one (pictured above) was in the same borough of Hackney that the Olympic Park is located in. The Cultural Olympiad is an effort by the City of London to showcase art, music and culture along with the celebration of the Olympic Games. Though they have no sport related tie, they are often as impressive as the Games themselves, so yesterday I stopped by one I was eagerly anticipating – Art Drive! 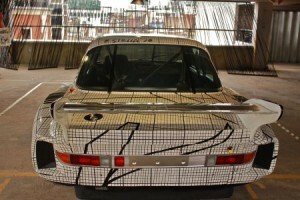 The BMW Art Car Collection, a collaboration between the Institute of Contemporary Art, BMW and the Cultural Olympiad. Art Drive! is a pop-up exhibit set in a seven-story Shoreditch (East London) parking garage. Featuring 17 cars decorated by the world’s leading contemporary artists, this exhibit is an impressive and humbling collection. 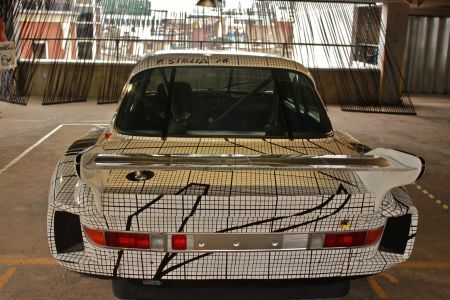 The world famous BMW Art Car collection has been on display separately, in the Louvre, the Guggenheim and the Tate Modern, but never all together in Europe. Combining artists with backgrounds in everything from pop art (Andy Warhol, Roy Lichenstein, Robert Raushenberg) to painting (Native Brit David Hockney, A.R. Penk), the collection is impressive start to finish. This exhibit is experiential marketing at its best. For starters, the venue itself is perfect and true to the brand. It’s a multi-level car park that acts like a blank canvas. The vehicle elevator you ride to the top features a timeline of the collection, and the environment itself works hard for the experience. The décor is minimal, with only simple black ribbons strung at the sides of the car park. The open-air levels give it an impressive feel, and bring in amazing views of East London. Messaging about the collection is limited to one art house style poster per level, and per artist/vehicle – the lack of BMW logos is a refreshing change from similar brand experiences. Leaving the pop-up exhibit I can’t help but think that cultural heritage is going to be an increasingly difficult element for brands to attain. Will brands be willing to invest in legacy pieces like this? Will today’s artists want to take part? When BMW started this in 1975, it wasn’t a strategic decision by marketing or senior management, it was something they just wanted to do. Hopefully other brands feel the same way because I never painted myself as much of a BMW fan before today, but can honestly say I am now. To check out my pictures from the event and see the beautifully designed cars, click here.